Just how do you review one of the most talked-about and controversial games of the year? Easy: twice! Shion Uzuki and friends save the world amidst the cries of the out of work pseudo- intellectuals who oppose them. Is there a rule for reviewing an official prequel to a game known and loved (or hated) by many? Is it fair to compare it to its predecessor, even though the creators of it intend it to be a totally new, independent overhaul of the series? Perhaps not. 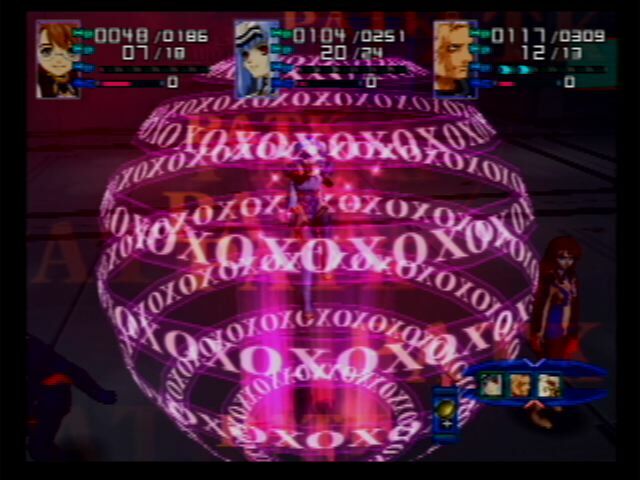 Xenosaga, the spiritual prequel of Xenogears, is just that: a prequel on paper only. The only fair way to judge its worth then, is to think of it as the first of a five game story arc, rather than draw comparisons to its cult predecessor. No one likes baggage. Most RPGs of yore threw their plot at the player fairly early: a band of misfits are supposed to save the world, so they collect stuff that helps them do it. With the evolution of gaming into big budget extravaganzas, most latter day RPGs follow canon, but unfold the threat of the day in a more moderate pace, with subtle clues and apt plot twists sprinkled throughout to build up the story. Xenosaga’s writing team, not happy enough to go the subtlety route, went for a painstakingly laid out setting via a plot whose pace is better described as sluggish. The generous cut scenes early in the game never leave you wanting in trying to understand what’s going on. Especially since in this case nothing much is going on about 70% of the time. You start out controlling Shion Uzuki, our heroine and engineer, who has been working on an android named KOS-MOS, a weapon developed to fight a mysterious enemy called Gnosis (beings eerily reminiscent of the Spirits in the Final Fantasy movie), for over two years. Now traveling on a military ship called the Woglinde, she winds up right in the middle of a surprise attack. KOS-MOS awakens, and leads Shion to safety. Slowly but surely, they end up putting together a ragtag team of variable human-like characters: magical girl doll MOMO, the cyborg Ziggy, chaos (with a lower case), a mysterious Anti-Gnosis weapon himself, and Junior, a genetically engineered for combat something or other. Soon they start stumbling upon secrets they were or were not supposed to stumble upon. There isn’t a way to be sure without a steady supply of no-doz. The story works best when the pacing of it picks up, that is, when the actions of the enemies are revealed to our heroes. Unfortunately, this is generally followed by another round of explanatory exposition on the part of said enemies, mostly psychologism mixed in with pop philosophy. The effect is over the top, heavily laden with every anime cliche, navel-gazing space opera. You have to either like this sort of setting, or be a masochist to be propelled onward with this game. One of the flaws of the game is to have the player dragged along by way of Shion’s wholly unclear motives. Of all the playable characters, she is the one who has the least reason to stick around, and plenty to walk away. It’s easier to sympathize with is Ziggy, who initially gets involved in things so to gain enough money to engineer away his consciousness, a.k.a. to wipe out his memory. If all humans in the Xenosaga universe are as self absorbed and droll as Shion and her pet assistant, it’s easy to agree with him. Later on, the protagonists are propelled onward by the "desire to survive". Yeah, well, leaving things alone would have been a lot quicker, people. As for the villains, they want to annihilate civilization because it’s empty of spirituality and blah, blah, blah. At least the main villain of this installment is colorfully insane bordering on creepy. Kefka has nothing on this guy. 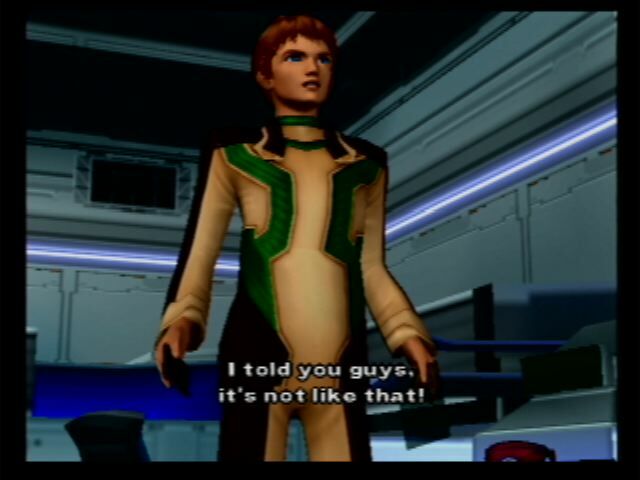 Half the "fun" of Xenosaga is about getting lost through the corridors of space facility after space facility, while giving tours of the ship, checking on various household appliances or going to a meeting, peppered by e-mails that have to be looked at right the minute they come in, even if it’s a memo. 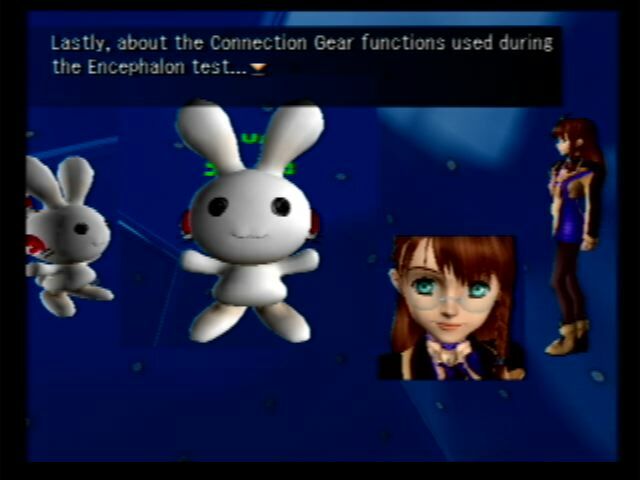 Then you can have a conversation about your feelings on said e-mail with your cute avatar bunny. You also have to break crates that happen to be in the way in most of the non-combat game time. The rest of the ample idle time is filled with opportunities to tackle minigames and side quests. Of note is Xeno Card, the most more wretchedly frustrating card game to appear since Tetra Master in FFIX. To figure out how Xeno Card works, one would have to understand what the hell is going on, by being able to access a practice mode for beginners. Unfortunately, there is no such thing. There’s an exhibition mode, but it is just as hard as the other modes. Because you’re supposed to improve your deck by buying countless packs of cards in game, as opposed to play and win the best cards, as happens in most card mini games, chances are Xeno Card is a glorified "collect them all" marketing scheme within the Xenosaga universe. Other entries include an obligatory Drill game to use one of your in game gadgets, a Casino minigame to be avoided by gambling addicts, and a AGWS Battle minigame that quickly loses luster. The main side quest here is one involving keys for red doors hidden throughout the game. This showcases the one good feature of the game, for which its designers should be commended. Previously explored areas can be accessed by activating an environmental simulation of each specific area at specially marked save points. Not having to backtrack through a thousand other areas to go back to the first dungeon definitely eases the tedium if one needs to backtrack for a special item. What of the combat game play then? At a time when other RPGs are tentatively taking chances and trying to reinvent battle systems in the name of ease and streamlining, this battle system is clunky, and very repetitive. It features not one, but two menus, and battles frequently necessitate switching from one to the other. 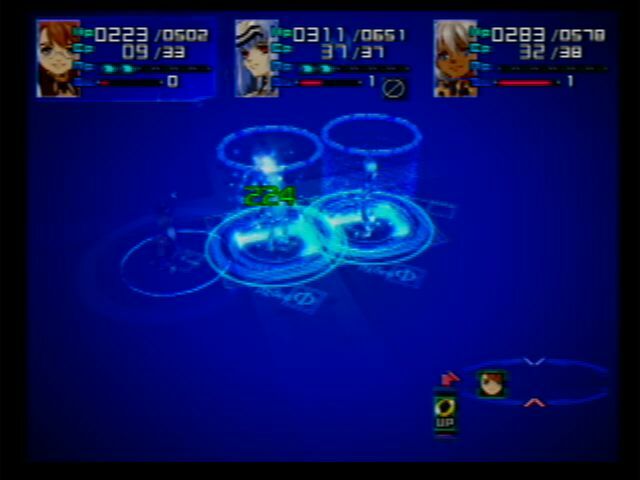 While most of the time you need not bother with the second menu, it becomes a frustrating feature when using AGWS vehicles, since the means to activate a special move are buried in the second battle menu: first one has to flip to it to guard so to reach maximum AP (Action Points), then again to activate W-ACT (the special move). It tends to make that type of combat cumbersome. Fortunately, the giant vehicles are not needed for most of the game, except for the few obligatory bad bosses thrown towards the end. There are bad news on the aural front as well. 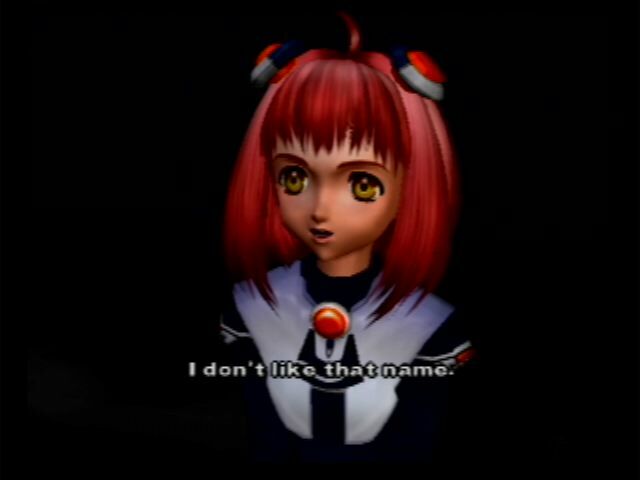 For anyone who really appreciated Yasunori Mitsuda’s previous work on many soundtracks he’s created or contributed to, Xenosaga is somewhat of a let down, in that there isn’t as much variety to the music in it as in previous efforts. Within the first 20 hours the bulk of the music for the whole game has been heard enough to grow tiresome. That most pieces are of the bland elevator pop variety, and easily tuned out turns out to be a blessing in disguise.